You are probably familiar with Google AdWords, Yahoo! Search Marketing, and MSN AdCenter, the three largest paid search advertising opportunities. However, have you considered running a paid search campaign using the online yellow pages? Even if you’re an online retailer that does not have a physical location, you could benefit from running ads on the online yellow pages. Let’s take a look at five online yellow pages sites and their pay per click advertising programs. Yellowpages.com is one of the biggest online yellow pages. It currently boasts over 100 million searches every month. With Yellowpages.com, there are several options as an advertiser. If you have a physical location then it’s important to make sure that your location(s) are listed. Basic listings are free. It also offers “Priority Placement Advertising,” which gives your business the highest possible exposure. Another option, though, is its YPclicks! program, which allows you to pay one source a fixed monthly fee for clicks; your ads appear on the search engines using local targeting (geo-targeting). In this case, if you’re already advertising on any of the major search engines, you would not want to pay extra for additional PPC advertising that would potentially interfere with your current Google AdWords or other pay-per-click ads. A search at Yellow.com allows you to identify many different yellow pages websites, including Superpages.com, Yellowpages.com (mentioned above), Whitepages.com, Dexknows.com and Yellow.com. I recently performed a search at Yellow.com for shoes. I live near Dallas, Texas, so I searched for shoes in Dallas Texas. The search results were served up by yellowpages.superpages.com, and the sponsored results (the PPC ads) come from SuperPages.com. There were several PPC advertisers or “sponsors,” most of them being online retailers that did not necessarily indicate that they were in the Dallas, Texas area. In this case, although I searched at Yellow.com, the PPC ads are from Superpages.com. That brings us to Superpages.com, one of the largest (if not the largest) online yellow pages sites that allow advertisers to pay directly for clicks. As you recall, your PPC ads on Yellowpages.com show up on the search engines, not on the online yellow pages websites. And even the other yellow pages websites display Superpages.com PPC ads. Superpages.com has four main options for businesses. Online business listings are free. They also offer pay per click, pay per call, and websites (they will create a website for you). The PPC and pay per call will most likely be the best option for online retailers. The PPC option allows you to target certain geographic locations and set a monthly budget. The minimums are $15 a month and $.20 cents a click. They provide a unique “max price calculator,” which is helpful even if you are not paying for ads on SuperPages.com because you can use the calculator to determine how much you can afford to spend per click. 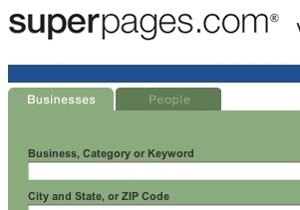 There are other tools at Superpages.com, including a way to “view your competition” by entering a keyword and your zip code. There’s also a ROI calculator, which allows you to calculate your return on investment for pay per click advertising, including costs, sales, profits and your return. Pay per call is also an option, especially if your ecommerce business has a call center where customers can call to place an order. As you can see, there are a few options when it comes to paid search on the yellow pages websites. However, Superpages.com has the most tools you need to be successful as an online advertiser.